As I write this, teachers are probably either preparing lessons for classes already in session or preparing to return to the classroom after their summer break. No doubt they gather in the teacher's workroom/lounge in the morning before heading to their classrooms. 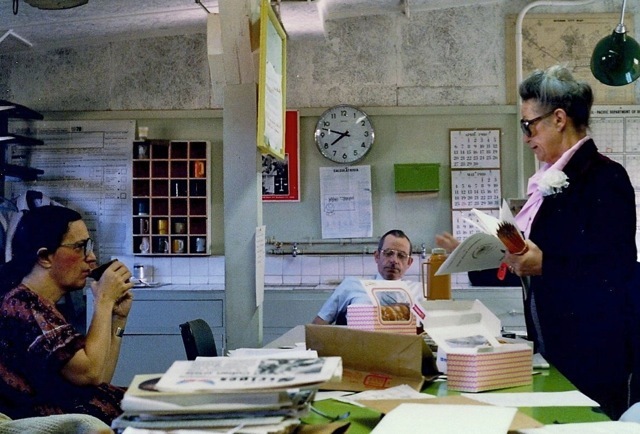 I have never seen a tidy teacher's lounge/workroom. Tables always seem to be strewn with piles of papers, books, boxes/plates of treats, and possibly clusters of coffee cups/mugs. 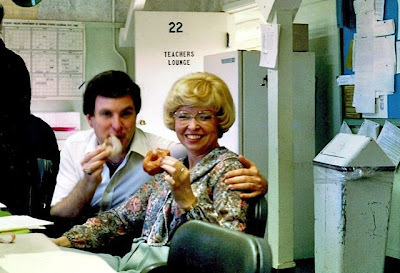 Mrs. Berlin, the guidance counselor at Edgren shown on the right, holds a fistful of pencils for one of the standardized tests that were administered by the DODDS (Dept. of Defense Schools) every Spring. She explains the day's testing schedule and procedure to the Art teacher before first period. Note the cubbies for coffee cups to the left, and of course, the boxes of donuts on the table. Teachers' Lounge before beginning a day of administering tests. 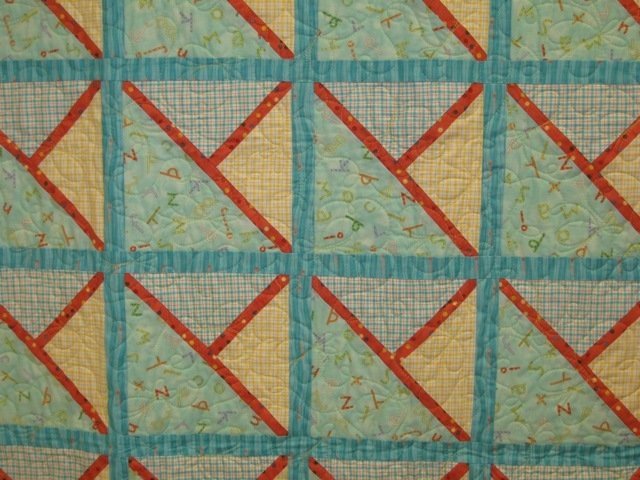 I am always surprised how a quilt made of multiples of a single block can make such a statement. 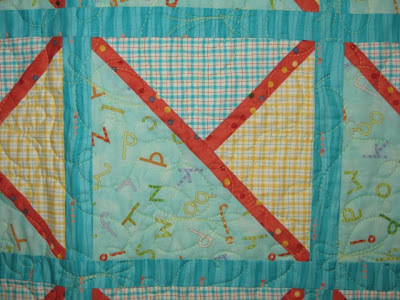 The block and color arrangement were repeated to form diagonal rectangles that created a striking baby blanket. 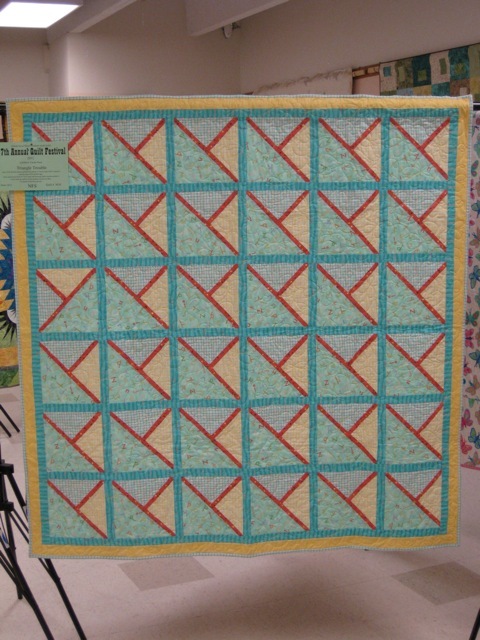 Triangle Trouble, pieced by Carole S.
I love the graphic impression this quilt gives the viewer and how it is accomplished with one, simple block. 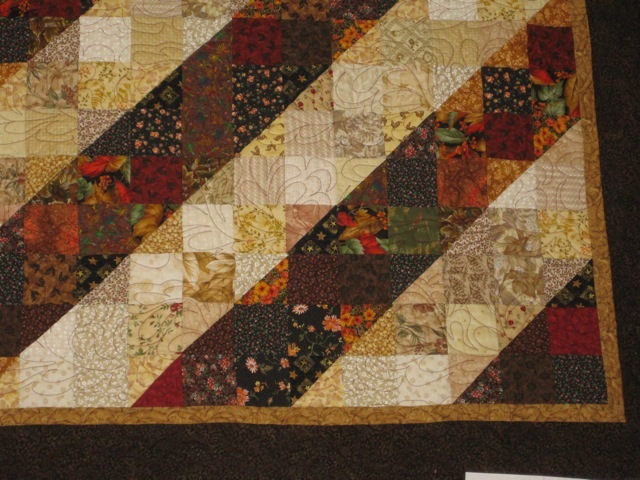 Over the weekend while organizing files on my computer, I discovered some forgotten photos of quilts in historical settings. 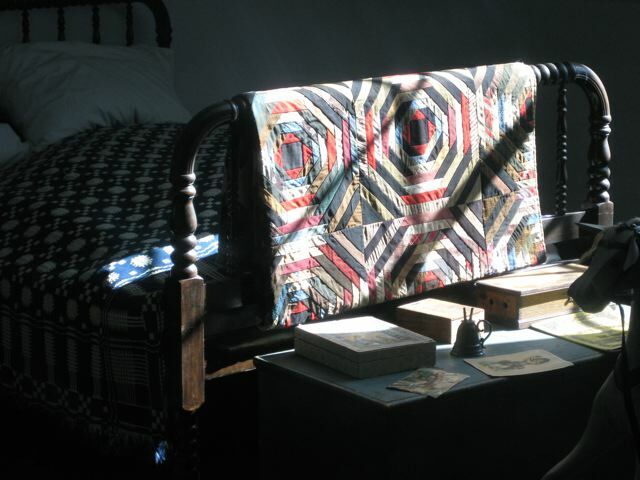 The photos in this post were taken at Fort Laramie, a National Historic Site in Southeastern Wyoming. Fort Laramie is one of my favorite places to visit because I love wandering through the old buildings and walking the grounds. Yearly from 1973 - 1979, I visited the site and took photos of the remaining buildings. When I returned in 2009, I was happy to see the site is being well-maintained and is now under the direction of the National Park Service. 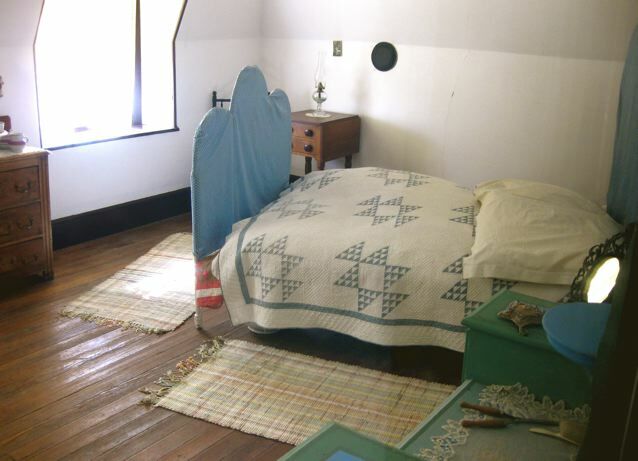 According to the National Park Service website. . .Originally established as a private fur trading fort in 1834, Fort Laramie evolved into the largest and best known military post on the Northern Plains, before its abandonment in 1890. This “grand old post” witnessed the entire sweeping saga of America’s western expansion and Indian resistance to encroachment on their territories. 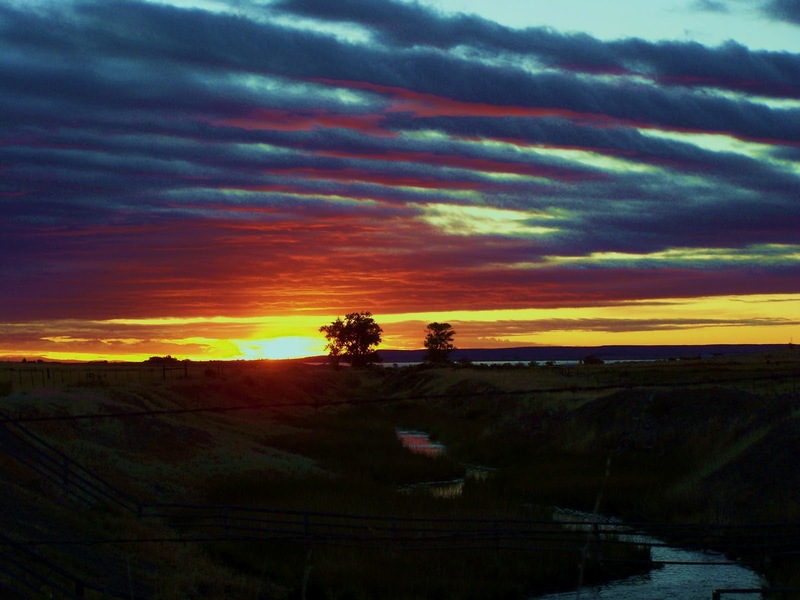 A free pdf of the book, Fort Laramie Park History 1834 - 1977 can be downloaded from the National Park Service site, but be aware that it is a large file - nearly 2MB. I shared some other images of Fort Laramie here. Forest fires in Wyoming, Colorado, Idaho, and California this summer resulted in extremely smoky skies and some beautiful sunsets. These sunsets prompted Cheryl to name a new Western Region Oddball Knitters Baby Blanket "Sunsets." Cheryl used a brilliant yellow and orange for the beginning section and passed the needles on to me. I used the top photo as inspiration and added the maroon and mauve stripes. 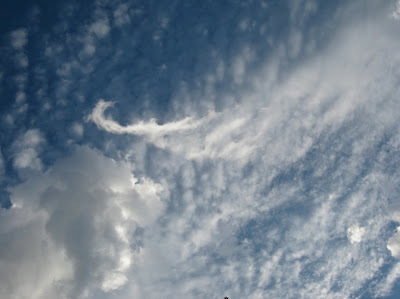 It was the "hook" on this cloud that caught my eye, and between knitting and listening to the music of the Community Band, I watched as the hook eventually disappeared into an ordinary cloud. The month of weekly evening concerts in City Park allowed me to relax and admire the sky as well as enjoy the music. What do you enjoy about Summer evenings? Some of the restaurants in Japan had small grills in the center of the table which allowed guests to prepare their own food. Notice that we are seated on cushions around the low table. 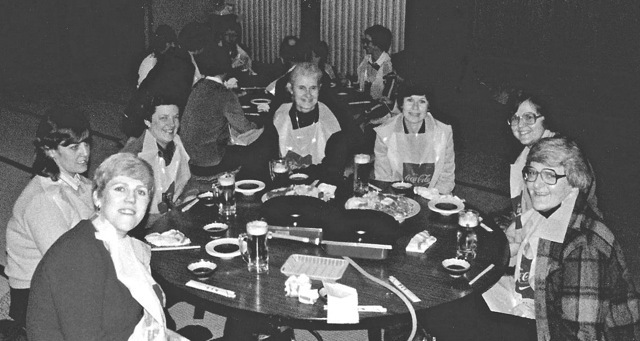 All of these women, as well as those at the table in the background, were teachers in Misawa and flew to the northern island (Hokkaido) for the Sapporo Snow and Ice Festival. Previous posts about the festival can be found here. 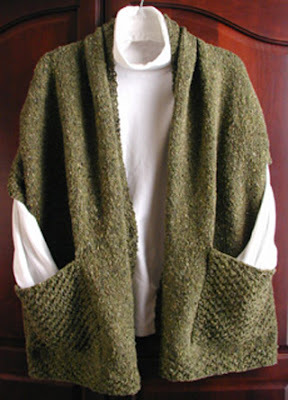 Knitting buddy, Cheryl (no blog) showed me the pattern for Lisa Carnahan's Reader's Wrap (AC-010), and I fell in love and knew it was a "must knit." I wanted to use a lace-weight merino/silk blend from my stash, paired with scrap sock yarn. 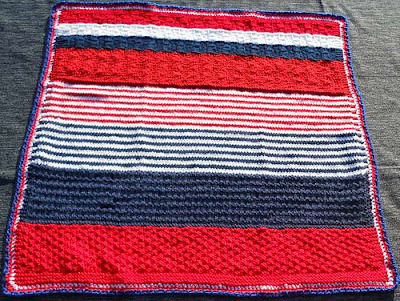 The two together is not quite worsted weight, so I went down a couple of needle sizes: I am using size 7 needles and 90 stitches. 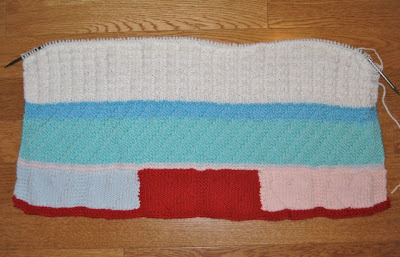 The first 36 inches is knit with scrap sock yarn (superwash) with the lace-weight merino/silk blend. 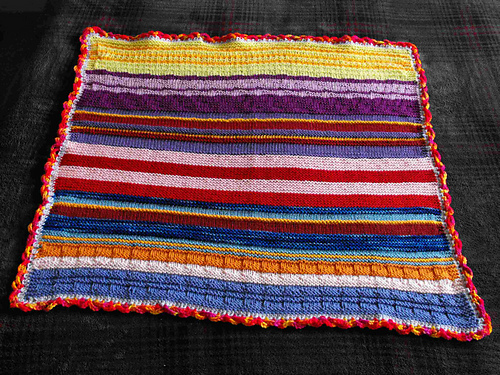 I am pleased with the result, but since I ran out of scraps, the remainder will use a full skein of Noro sock yarn paired with the lace-weight. 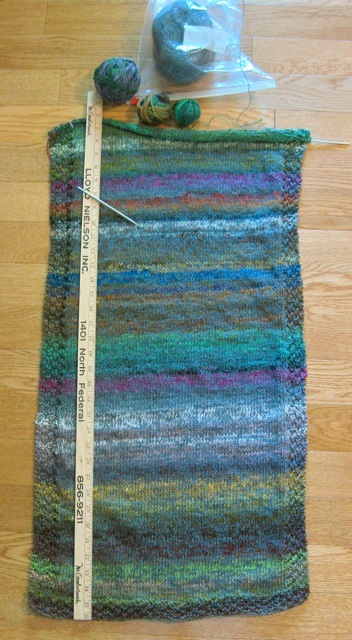 My wrap will be at least 72 inches, since I have a long "wing span." 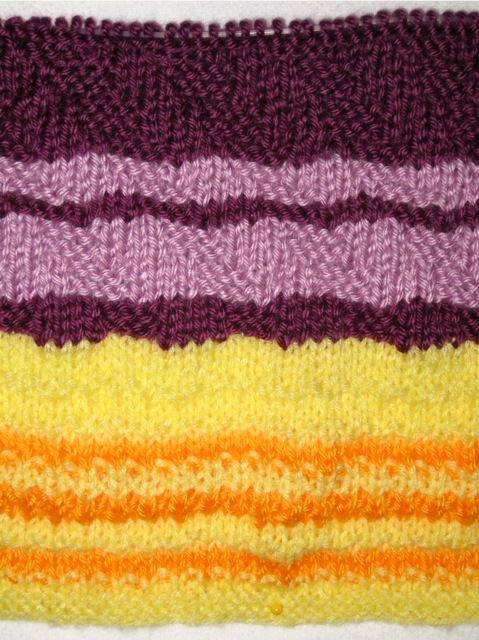 This is a fun knit, and I like how it is progressing. Leonard and I have a lot in common - trying to learn something that is beyond our grasp. 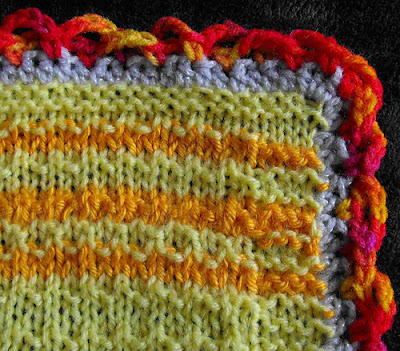 For Leonard, it is knitting; for me, crochet. I enrolled a class and completed the assigned "homework" ; however, the instructor cancelled the second session and eventually the third session was cancelled, too. It was probably for the best, as the hook just did not "fit" my hand like knitting needles. After that experience, I added a single crochet to a hand-knit hat. Working with the awkward hook took me several hours - much too long to make me even hopeful that I will master the skill. I'm sure a child could have finished in less than half the time it took me to add the edge. I may attempt crocheting again, but today, I understand Leonard. What skill has you baffled? 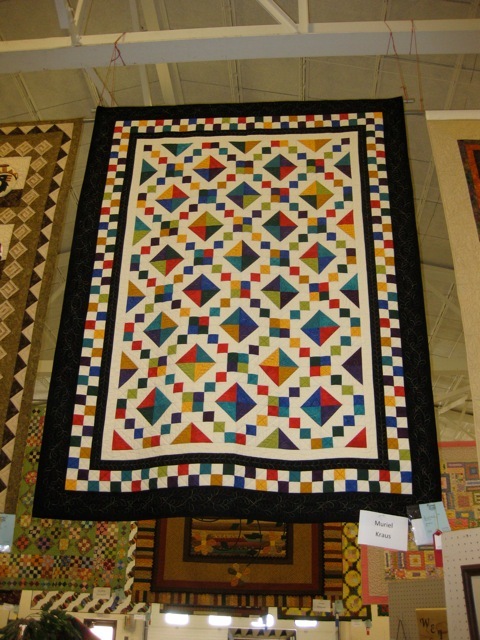 Last week, I went to Dubois with three knitting friends (Sheri, Cheryl, and Nancy) for the annual Never Sweat Needlers Quilt Guild show. 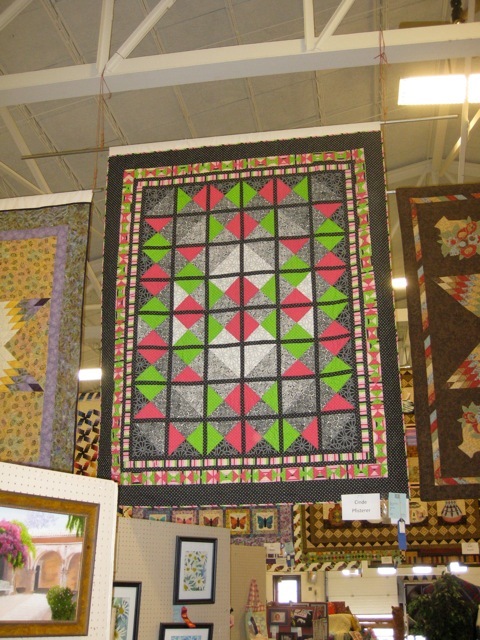 We were not disappointed by the variety and quality of the quilts on display. I'll be showing several of my favorites for the next two weeks. I love the design and the scrappiness of this quilt. 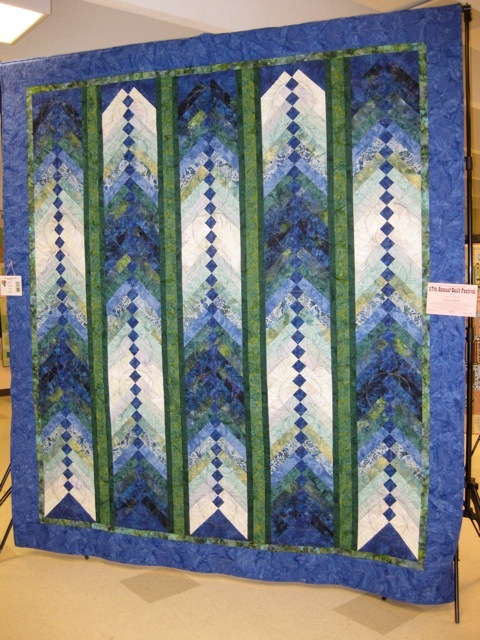 pieced and machine quilted by Eileen G.
I am partial to blue, and this quilt caught and held my eye. I love it! I decided to continue with the two-row striping since those two sections are the middle of the blanket. 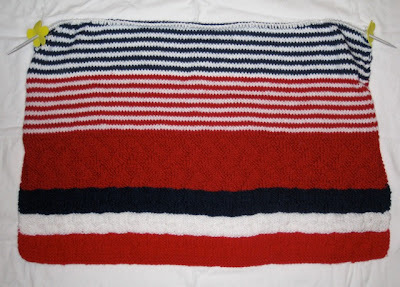 Perhaps the next knitter will add a section of solid blue and the final section will be knit with the larger stripes of red, white, and blue. 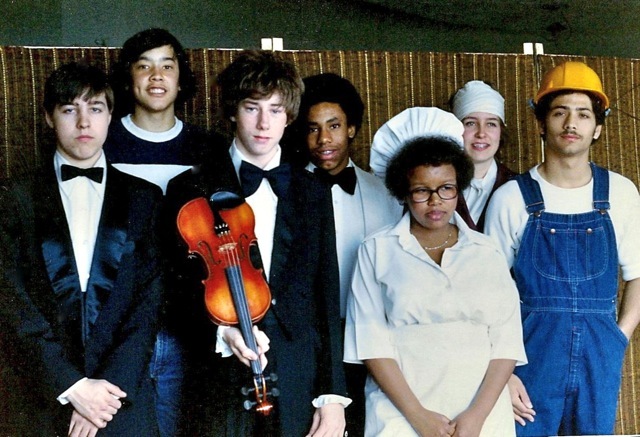 Language Arts, Drama, and Speech were the classes that I taught at Robert D. Edgren High School on Misawa AFB, Misawa, Japan from Fall 1979 until Spring 1981. 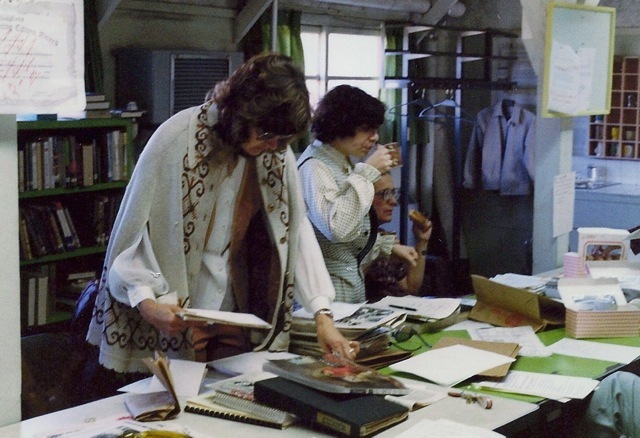 The spring of 1980 was Edgren's year to host the Pacific Drama Festival, an enormous task. 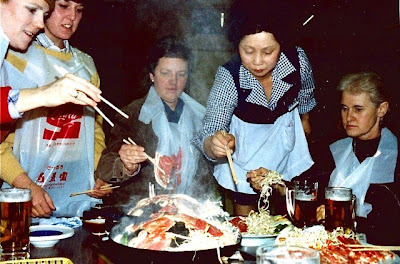 In addition to scheduling the plays and finding qualified judges, I had the responsibility of finding housing for teams, representing several military schools throughout the Pacific. Families on-base volunteered to provide meals, beds, and transportation for the students over the three-day weekend. It was a huge task for someone who had only been on base for seven months. My drama students prepared a cute one-act play, called Shubert's Last Serenade, for the competition. I don't remember much of the actual festival because the weekend and all the activities was a blur. I do remember being exhausted and relieved when the last plane load of students left on Sunday evening. 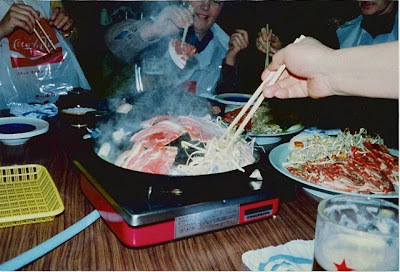 Since the students were military dependents, their sponsors obtained orders for them to fly to Misawa on military planes: C-130s commonly brought passengers to the base. Love You, Baby is a Western Region Oddball Baby Blanket. I'm not crazy about the three different colors in the first section, but I do like the hearts knit within the section. 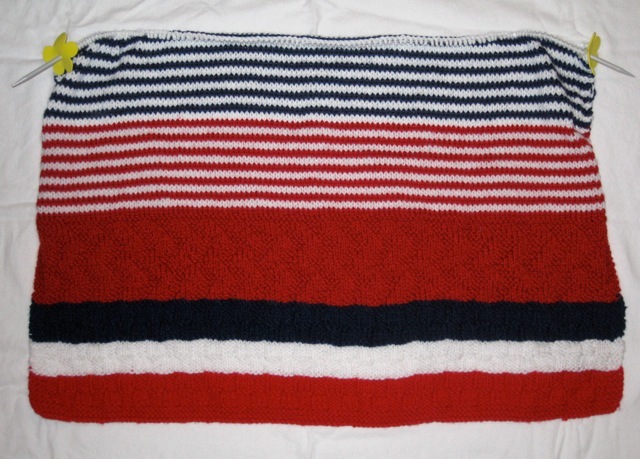 My four-inch section is knit with Red Heart Sparkling White in Checks and Ridges stitch. 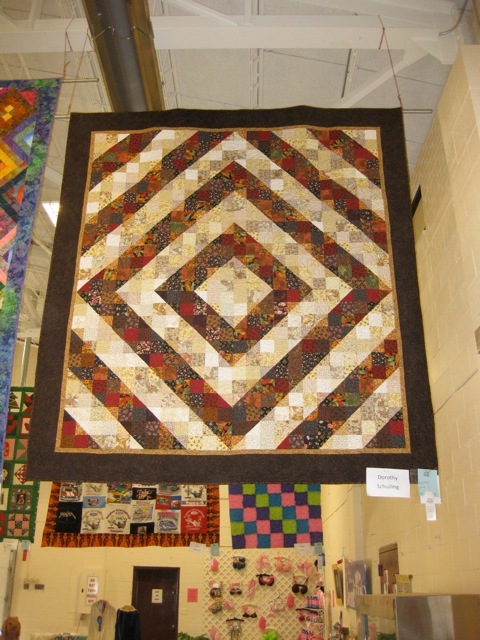 This quilt won a lot of awards at the County Fair. 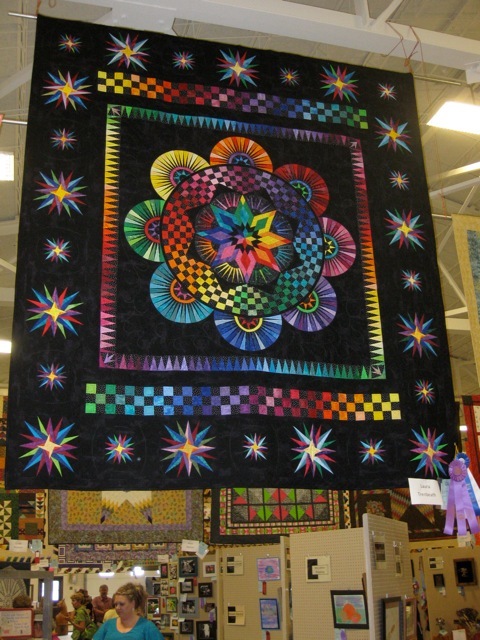 It was simply stunning and caught everyone's eye as they entered the exhibit hall. I'd never attempt to make anything like it, but it was gorgeous! 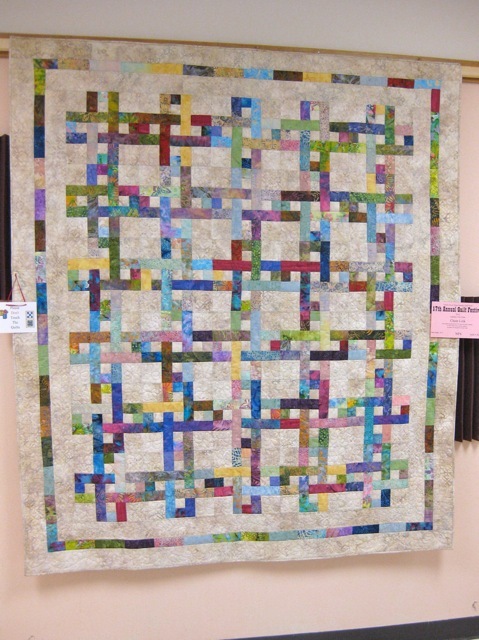 Even though this quilt was only awarded a white ribbon, I loved it for its design, its scrappiness, and its color. Quilt close-up to show construction and quilting detail. 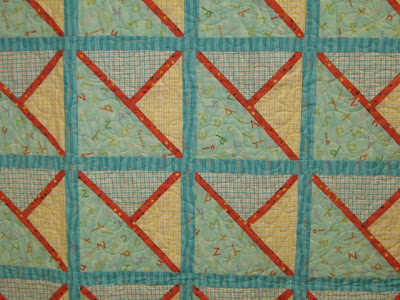 I tend to like clean quilt designs. This pattern would make a nice, scrappy Quilt of Valor. Another simple design that reminds me of Argyle socks. 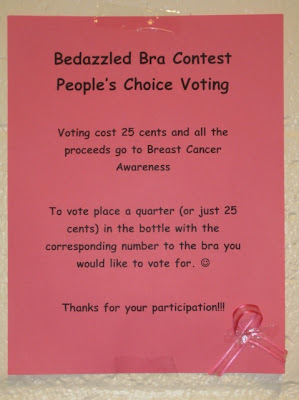 I admit my eyebrows raised a few centimeters and my brow furrowed deeper when I viewed the "Bedazzled Bras" at the County Fair. Some were quite outlandish and others simply grotesque, but it was for a good cause. Some were beaded. Others sported feathers or fringe. One was covered with pompoms; another, masked. 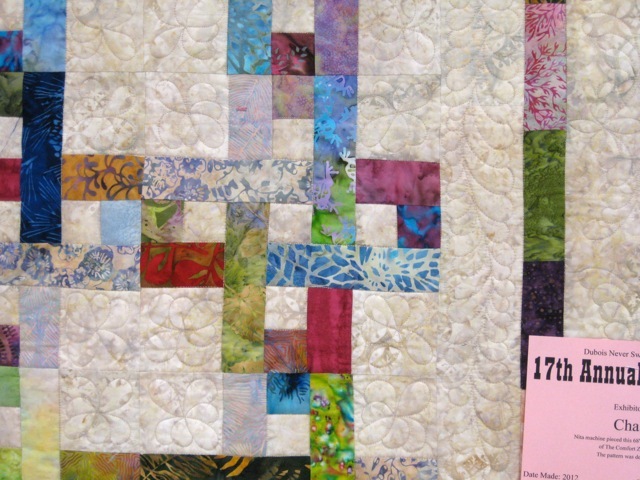 Some had additional lace or were altered. 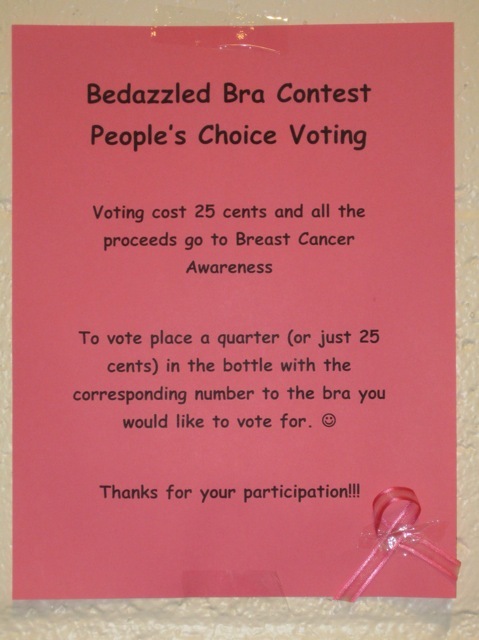 This bra was tastefully "bedazzled," and drew the attention of many University of Wyoming alumni. It was cute and one of the "tamer" bras on display. Others were pretty wild. This bra was unique and a real hoot with its additional "cup." 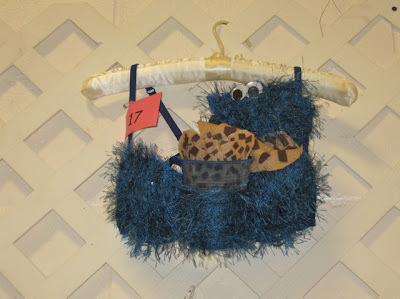 I never know what exhibits I'll see at the County Fair.